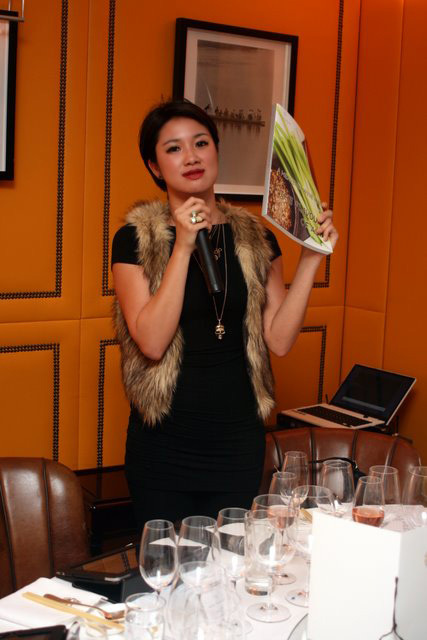 And we put their wine-pairing suggestions to the test at one of Hong Kong's foremost Cantonese restaurants - Island Tang. 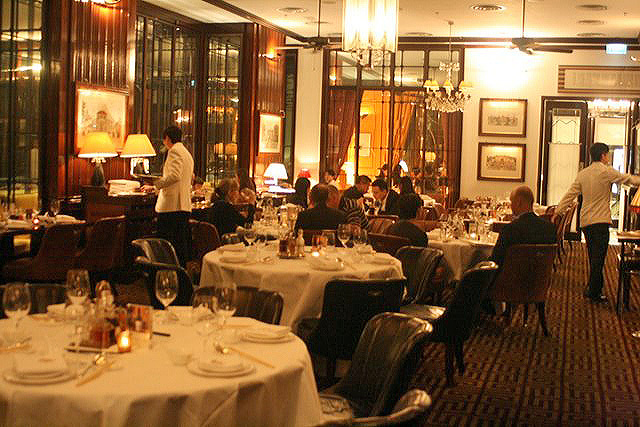 It's gorgeous - step through the retro doors and you're in cosy 1930s Shanghai. It's got a 1 Michelin star rating, but don't hold that against them. Island Tang has been consistently well-rated in many publications including the New York Times and the Financial Times. This is by Sir David Tang the dynamic tycoon and avid reader who started the Shanghai Tang clothing line, and the very exclusive China Club not too far away. 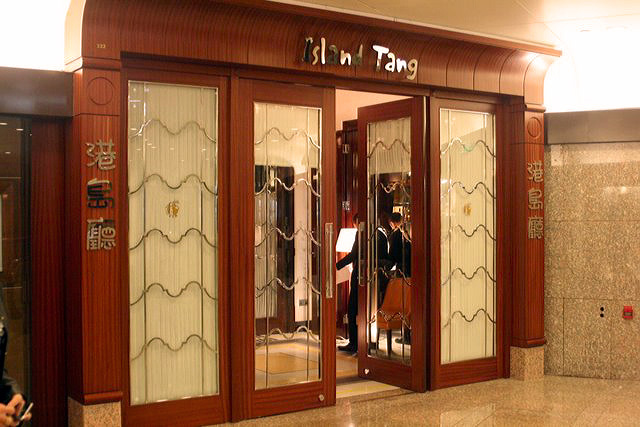 I've tried the China Club (had an event there some years back) and honestly, I much prefer the food at Island Tang. No membership required either! We had a private room, where we could indulge in our journey of wines with our eight-course dinner. The charismatic Jane Dee, Regional Brand Manager (Belvedere, Estates & Wines, Grand Marnier), Moët Hennessy Asia Pacific, showing us their new book on pairing wine with Asian food. Yes, the book came first, and the iPad app is based on it. I gave out four of those books in a previous post. And those who have seen my copy absolutely love it. 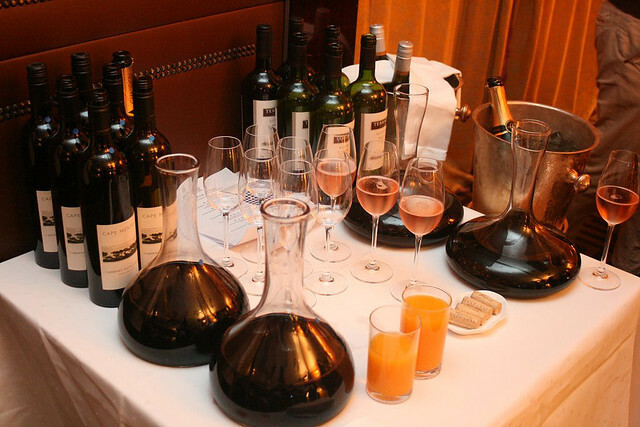 The book and app both feature wine labels under under Moët Hennessy. I never realised they had so many until this event. Well, at this dinner, we also got to try quite a few of these excellent wines. A sight to warm any wine lover's heart, no? 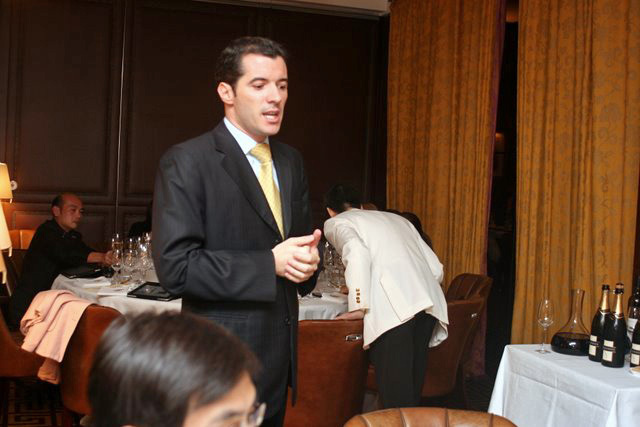 Wines and Spirits Consultant Arnaud Mirey from Moët Hennessy explaining each wine in detail, and why it goes well with the dishes it's paired with. You may have seen him on the app itself. Told you the app looks good. Anyway, there were amazing discoveries, right off the bat, from the appetisers. Island Tang Appetiser Delights - Spicy Frog Legs, Shichimi Tofu, and Century Egg. We had Chandon Brut, a nice bubbly that was a great hit with the rich and pungently creamy century egg! It totally cleansed the palate too, and you know how difficult that is with century egg. Special mention goes to the shichimi tofu. If our local restaurants could also produce tofu as soft, delicious and flavoursome as this, I'd be popping these nonstop. 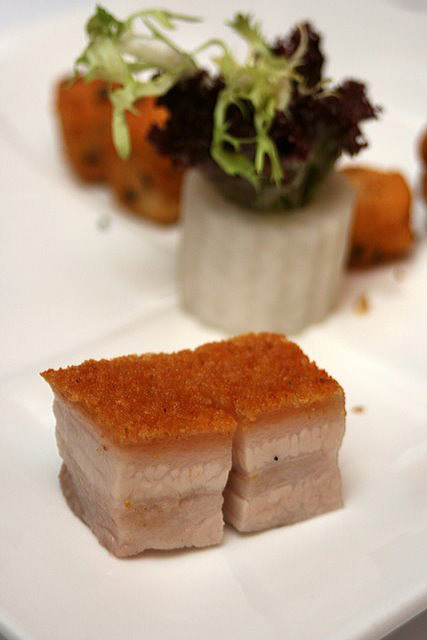 The best part of the appetisers was the Most Delicious Roast Pork Ever! I can't ask for a more perfectly and evenly crisped skin - such delightful crunch. And the ratio of fat and lean meat was just right. I'd just had Joy Hing (that's another post) before the dinner, and their famous roast pork is almost as good, but differently so (more like suckling pig). You can try this with the Terrazas Reserva Malbec, a deep red with hints of cassis. 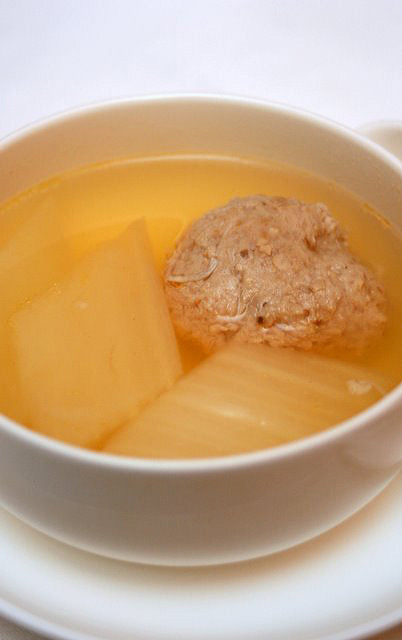 Double-boiled Meat Ball with Hairy Crab in Chicken Bouillon. They recommended the lesser known Cloudy Bay Pinot Gris for this. Cloudy Bay is more famous for its Sauvignon Blanc or Pinot Noir, but the Pinot Gris is light, floral, and not too acidic - perfect for the delicate soup. They use old oak barrels to age the wine, so the oaky flavour is not as strong. 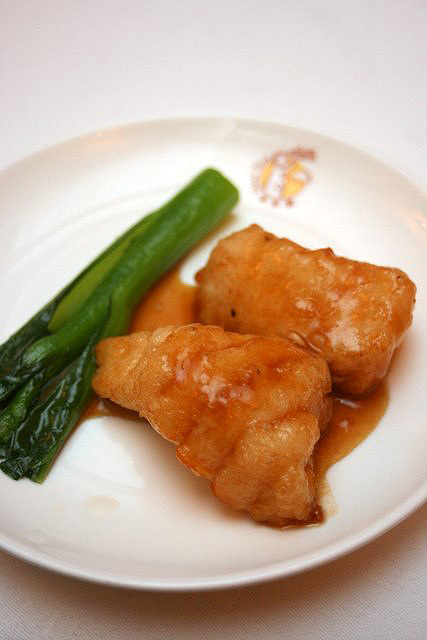 Pan-fried Fillet of Spotted Garoupa with Premium Soy Sauce. A Cloudy Bay Chardonnay was chosen to pair this awesomely delicious fish. The wine is more creamy than the Pinot Gris, and has a lemonish tinge. It's more Burgundy in style, so it's great paired with cooked fish and sauce. 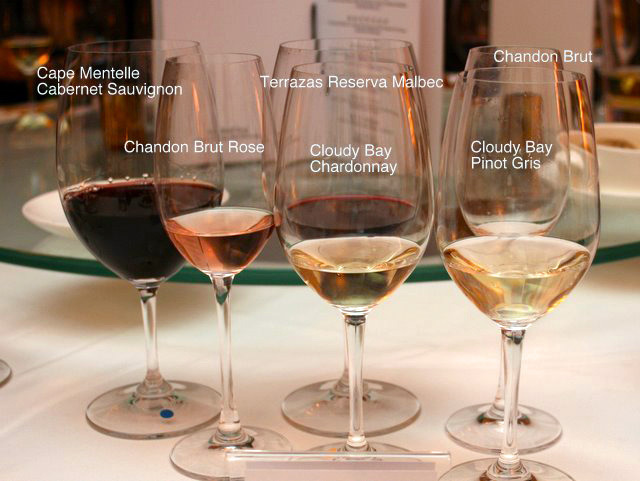 We had at least six different wines from Moët Hennessy, and this is what they look like. Back: Cape Mentelle Cabernet Sauvignon, Terrazas Reserva Malbec, Chandon Brut. Front: Chandon Brut Rose, Cloudy Bay Chardonnay, Cloudy Bay Pinot Gris. 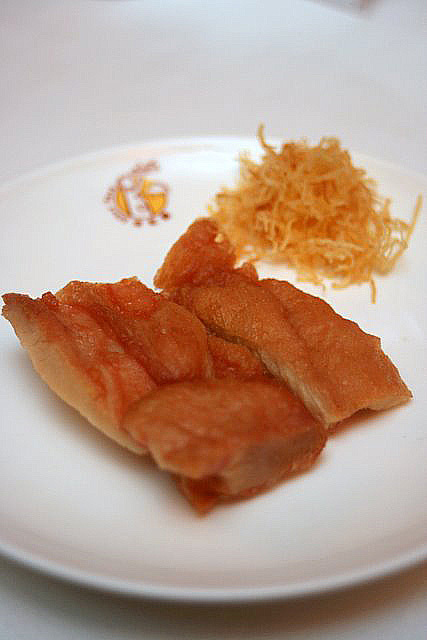 The next course was Pan-fried Chicken Fillet Marinated with Fermented Bean Curd. Both the Cloudy Bay Chardonnay and the Chandon Brut went well with this (they do with most fish and chicken dishes). 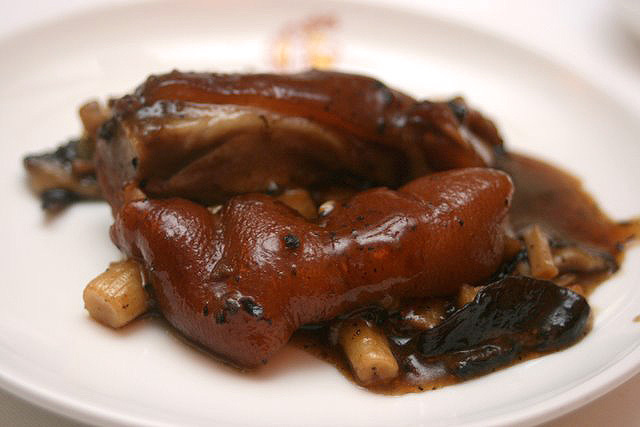 Stewed De-boned Pig Trotter with Black Truffle Sauce. Succulent skin and juicy meat, richly flavoured with truffle sauce. De-boned! What convenience! No unsightly gnawing on trotter bones. The Cape Mentelle Cabernet Sauvignon goes well with meat protein, and was a good match for this. But some people preferred the Terrazas Reserva Malbec as this particular dish had a lot of skin. There really are no rules, just preferences. 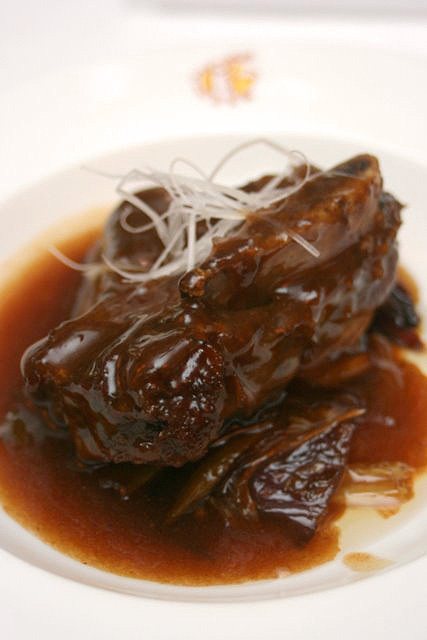 Braised Wagyu Short Rib with Onions, Peking Scallions and Spring Onions. This was a generous piece, and was so rich and filling that it proved a little challenging for some of us. The Cape Mentelle Cabernet Sauvignon was recommended for this. It met the luxuriously heavy dish head on, and enhanced it even more. 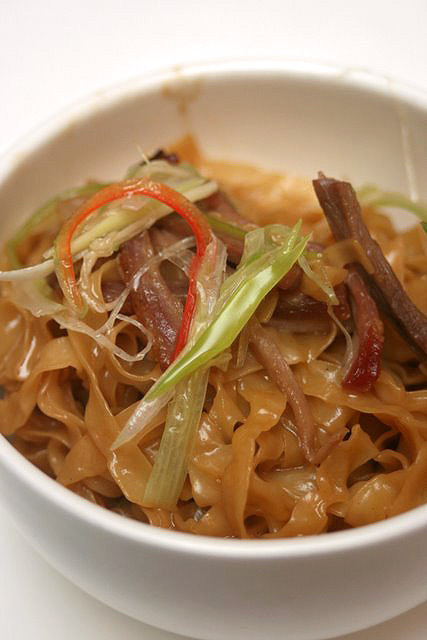 Braised Goose Web with Abalone Sauce on Egg Noodles. I'd envisioned full goose webs which might be fiddly to eat, but wow, Island Tang really takes care of everything for you. The goose web is in thin easy-to-eat slices. The abalone sauce is also sublime. It's the best mee pok I have ever had. 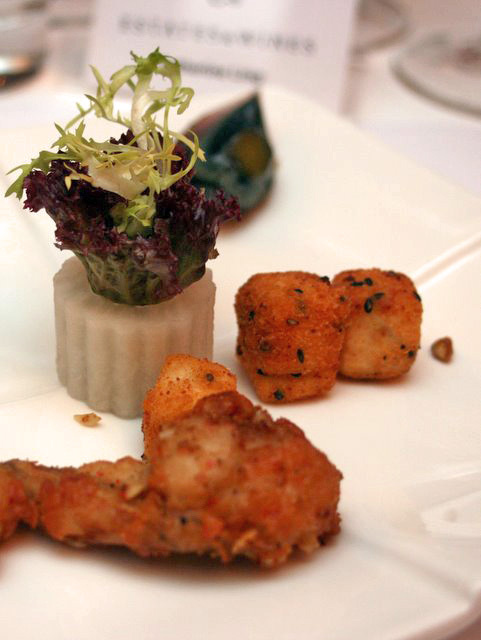 For this dish, Moët Hennessy asked us to see which wine we would pick. Most people chose the Chardonnay - it's not too sweet and good with meat. By the time dessert rolled by, we were rolling on our tummies. 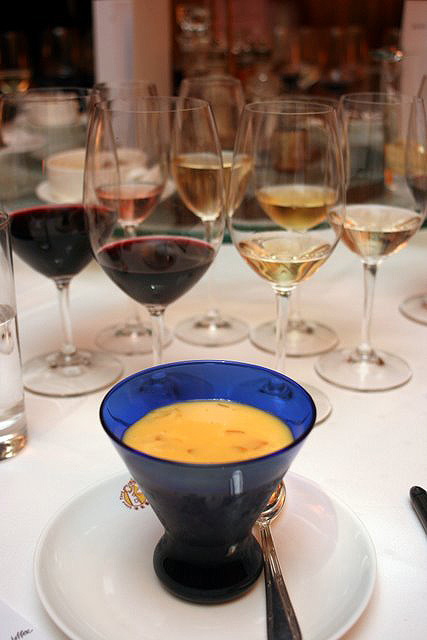 The Chilled Mango Pudding is surrounded by so many glasses of wine, you'll swear you're seeing double after a while. But it was here that the crowd favourite Cloudy Bay Riesling was unveiled. This is a late harvest wine, which means more sugar has accumulated in the fruit, and they use a noble mushroom or rot to dehydrate the grape further. All the sugars are even more concentrated, and it develops flavours like apricot, and strangely a kerosene scent too. We thought it was more delicious than dessert itself. And so the evening ended most happily. Here are some of the bloggers and PR folks with Arnaud (from left to right, Jason, Michelle, Virginia, Samantha, Rayner, Olivia and Patrick). I was thrilled to finally meet Jason Tse the Bonvivant, as well as the effusively funny Michelle Ng of Chopstixfix, and Patrick Lai of SmashingPumpkins fame on Openrice with more than 3,000 reviews! I also met KC the gourmet, Jennifer Luk, and folks from Winebuzz.hk (not pictured here). Remember to download the gorgeous iPad app Flavours Asia! Major thanks to Moët Hennessy for flying me up to Hong Kong to experience the iPad app, the enlightening dinner paired with lovely wines! Yes, it's very well-marinated chicken! Nice colour indeed.